Happy Friday! I'm still directing every bit of energy to getting my whole home changed up. It's no small task, but I'm motivated because there are some exciting things on the horizon. Project Family Room Happy is almost complete. Art will be arriving from the talented Zoe Pawlak in the next few days. Here is the inspiration pic she tweeted... my stuff is on the left half. There's something cool that happens when you have a relationship with, and trust, in an artist. You give them a tiny bit of direction and that free reign, or cart blanche allows for the most magnificent creations. I adore Zoe, you've probably assumed that by my constant mention of her. It's kind of amazing to incorporate the art of someone you admire in a space that is meant to be closest to your heart. The best part is Zoe's art is what inspired the desire for an overhaul in the first place (here). Well, it made my day when she sent this email. She just gets me, and of course I went for the surprise. Who doesn't love a surprise. I cannot wait for these packages to arrive! I've also gone ahead and ordered a couple of Janis Nicolay's photos (Pinecone Camp). The one below is called Swim. I'm pretty sure I've stood in the exact spot it was taken from in Australia. Good times. I threw caution to the wind with this project and let my heart lead me rather than some strict aesthetic that I knew would work. The funny thing is, I'm certain this will work beautifully because of the passion behind my specifications. I'm curious and delighted to see what the results are like myself as this is not usually the way I approach things. It's a mystery to me at this point too. I'm off to source out some trims and frames and to pull together a pillow story for my bedroom...more on that in the next post. So.Much.Fun! I can not WAIT to see the finished product. Love the row of pillows...and all else! All these little bits look so great, can't wait to see it all come together! What a great feeling like you said to have someone understand your vision! I've wondered who this artist is with the girl paintings. I'm saving my pennies, errr... loonies to buy a first original painting. I'm glad to have a name and link to look in to. cheers to friday! 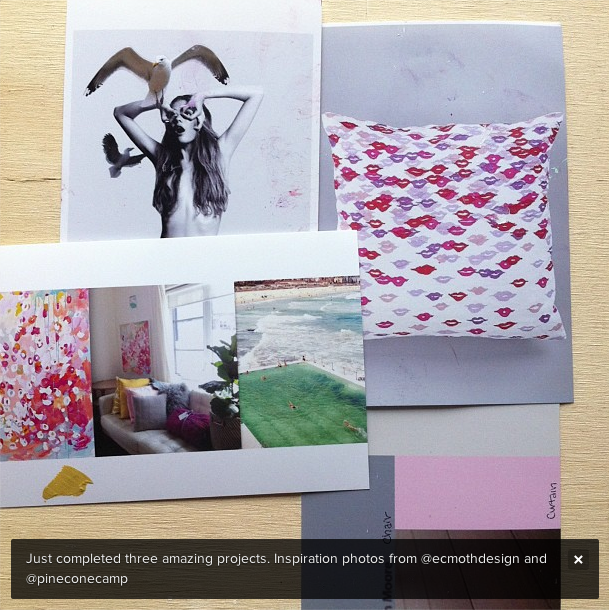 :-) Katie G.
Love the mood board and art - can't wait to see more! Erica it is so exciting to wait for a work of art to arrive. Love all you are doing. 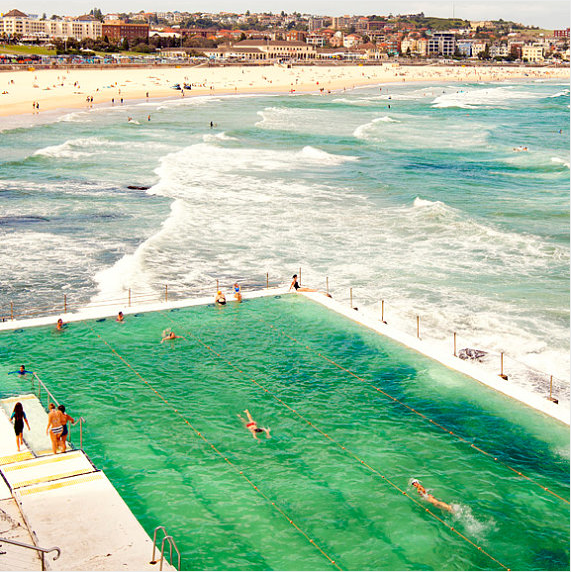 Love that last photo - definitely had to be taken from Bondi Icebergs in Sydney! Gorgeous view of the Icebergs Pool and Bondi Beach! I love living here!! Good luck on the gorgeous home makeover Erica! Cannot wait to see the changes and final outcome! Oh you are keeping us in suspense I agree if you go with your heart you will love it. oh my what a cute pancake! I have this one from Janis. She did a great job meeting my specifications which were very deliberate. I adore the piece it is going in my den which has been built around the photo.